There's just two more sleeps until Love Trails Festival! I am so excited, after a week in the office I can't wait to spend the weekend outside camping, running and having fun with what I know is going to be an awesome group of people. I'm also really looking forward to spending time in Wales! My family is from Swansea, but since my Nana passed away a few years ago I don't get down there all that often and I've never taken Mike to the land of my fathers. It's going to be a pretty special weekend! There's so much going on at Love Trails, from runs to workshops to talks, it's hard to know where to start when it comes to deciding what to do! So rather than walking around in a haze of indecisiveness I thought I'd share my highlights from the festival schedule! I won't be getting to the festival until a bit later on Friday (traffic dependent!) so unfortunately it's unlikely you'll see me at some of these talks/workshops, but it doesn't mean you shouldn't go! They'll be fab! If you've not worked out with Project Awesome before you need to go to one or both of these sessions! This crew are awesome and their tough workouts are an awful lot of fun! Expect obnoxious outfits, lots of cheering and hugs galore from some of the friendliest people I've ever me. I'll be hitting the Saturday session, come hug me (if you're really lucky Mike will succumb to pressure and come along too, so hug him as well!). This one is free and you can just turn up! Matt's an experienced ultra runner who trains runners of all abilities, helping them achieve their goals. Sounds like the right man to show you how to set goals and targets, and create a training plan that is just for you! I really really hope I make it to the festival in time for this one! When you live in a city it's so easy to dismiss adventure as something out of reach because of the landscape, but it doesn't have to be that way! Belinda's workshop is guaranteed to be mega inspiring and will have you thinking up all sorts of adventurous schemes in no time! One of the best running podcasts is going LIVE and it's bringing together two of the most entertaining men in running, David Hellard and Danny Bent to discuss the death of the running club. This is one you won't want to miss! Come and nerd out with me about women in running and hear some of the most awesome women in the sport sharing their views. Saturday is going to be a crazy busy day for me, not least because I'm one of the run leaders for the Mikkeller Run to Beer! I've heard a lot about this crew of booze hound runners and I can't wait to run with them. Meet us at 2.30pm for a run followed by some special Love Trails Session IPA - consider it a warm up for the iconic Beer Mile later in the afternoon! I worked with Max a few weeks back in Holland and he is an exceptionally annoying man, but he is also an insane photographer, videographer and trail runner whose dedication to his work kind of blows my mind, so I'll let him off! I can't think of a better person to share how to record your runs and epic-ness in style. This one is free, but you'll need to book on site. How do you do it all? It's a common question if you run/work/have a sort of life, and usually a difficult one to answer! 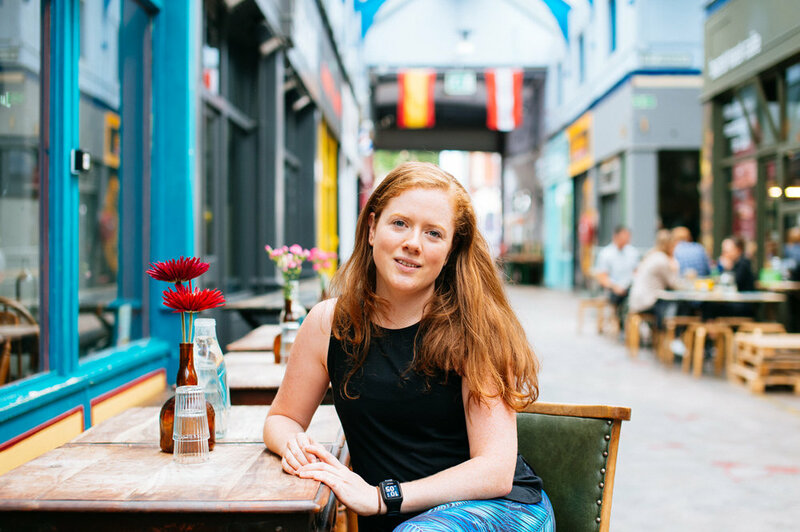 Often running is the first thing to go when life is busy, but Annie is here with ideas to inspire and motivate. Curious about what it means to be a mindful mover and the idea of connecting with the reasons why we move? Come along and listen to Chevy chat all about it. You'll be nosediving down the rabbit hole before you know it. Anna is one of my favourite people, and also the reason why decent photos of me exist, and I couldn't not include her on this list! Anna is genuinely passionate about reducing waste, it's part of her life and I can't think of a better person to inspire you to ditch the single use plastic! She recently talked me into giving up face wipes, even when camping - a serious coup! Come and run with me again! I'll be one of the leaders for the Love Trails Coastal Adventure at 9am (which is also at 9am on Friday and Saturday...but you know you want to run with me!) and I can't wait to explore those amazing views over the salt marshes and the festival site! I am all about the mind-body connection, and this talk with James Holt explores the concept that running is just as much in the mind as in the legs. Another talk where you can come and nerd out with me! Participation and accessibility fascinate me, and it's something I've explored a lot in my academic work, I'm looking forward to an interest discussion around barriers to sport for those who are likely to benefit from it the most. I am passionate about the power of social running, it can be life changing! If it's not something you're involved in already, head to this talk and get inspired to find a social running group, if you are then remember why social running is so special! Of course, any post about a festival wouldn't be complete without some top tips for survival! Here are the big things I think you need to know when getting ready to head to The Gower! the festival is trying to be free of single use plastics, now's the time to take some tips from Anna and Charlotte and go zero waste! remember your swimmers, there are hot tubs! don't pack booze - Love Trails is a grassroots festival and a lot of the costs of putting the event on are recouped through the bar. So support all the work that's gone into putting on a great weekend and buy some of the fab beers on offer at the bars. it's Wales, the weather can be variable (and wet), pack accordingly! don't forget your head-torch, it's essential kit in a field. Are you headed to Love Trails this weekend? Let me know where I'll see you in the comments! * images courtesy of Love Trails Festival. ** I’m an ambassador for Love Trails Festival, but all opinions are my own.